Magic Pest Control is the finest termite, pest, birds, weeds and Guaranteed Scorpion control company serving Phoenix, Scottsdale, Chandler, Mesa, Gilbert AZ plus all the greater Arizona cities. Our Pest control services include residential, commercial, HOA's and Apartments. We are Arizona’s premier Pest Control company offering quality, dependable, environmentally responsible methods to keep your home or business safe from unwanted pest. We are a locally firefighter family owned business with over 31 years of experience, our pest control technicians are among the most professional, licensed, knowledgeable, honest, loyal and trustworthy in the business. We offer the best prices in town for any pest control needs, including termites, scorpions, bees, bed bugs, spiders, ants, roaches, earwigs, birds and weeds. We Guarantee Scorpions gone call for details! Call today for your free pest elimination estimate! We have been using Magic Pest Control for over two years now. We do quarterly inside and outside treatments and semi-annually have a scorpion control treatment. They must be working as we have no "visitors"! Our technician, Gage, is great - on time, thorough and friendly. This was my first experience with magic Pest Control. The serviceman showed up in time, he was efficient without any disruption to the people in the house, and very polite throughout. Wasn't happy today. Usually a Sebastian is the best, but because a tech was out sick, my time got pushed back 3 hours and then Sebastian called and said he was in his way but I. Never saw him. Then I called the office and they said he was here. They called Sebastian and he said he was here but I didn't answer the door. I also had housekeepers her and vacuums running and didn't hear the door. So he just did the outside and left an 85.00 bill in my door for half the treatment. What's even stupider, he had my phone number, he could have called. We scheduled for him to come back next week to do the inside. I have been using magic pest control for 7 years now. They have done pest control as well as termite inspections for me. They have great prices and very professional customer service. I feel like they use really good chemicals because it keeps the insects away. I will continue to use there service. Quick response and friendly service. Needed help as we are selling our house and termite treatment was quick and on time. I've been using Magic Pest Control for 3 years, I started using them when I had a termite problem.- after that I started using them qtrly for pest control maintenance, Very happy with the service the is provided. We have been very satisfied with our service from Magic Pest Control. We have used their monthly service for 5 years now. Derrick is nice and professional. Recommend them highly. I have been using Magic since the start of the year and they are incredibly great. Above and beyond! Thanks to the crew and the staff! We have been using magic pest control for 8 months. They always spray around the house inside and out. We have always had very friendly service and I am glad to know we won't have to worry about a bug problem. I have been using Magic Pest Control for 6 months, they know their bugs. I use quarterly service for the properties I manage; they communicate directly with my tenants and are always on time and pleasant. We've been using Magic Pest Control since September, 2015. We were in our new home for about 1 year and found scorpions in two rooms and the garage. We've been under contract for scorpion control since, and the bi-monthly treatments have controlled the problem completely. In fact, we very rarely see any type of bug, and when we do, they're either dead or dying..
Scorpion Treatment every other month, House was treated for Termites in January. Very professional, knowledgeable, and informative. The Tech was detailed in reviewing the space and commented about pest activity level. I have been using the termite and pest control service for two years. I have been very impressed with the courtesy and professionalism of the service in the outstanding results. I would highly recommend them to anybody. I was referred to Magic pest Control by my realtor. I had discovered a beehive in the backyard. Magic Pest Control was able to squeeze me in on the same day. Sebastian was totally amazing and was very professional during the whole process. I will use this company again if needed, and I will absolutely refer to friends and family. Thanks. I'm a commercial facility manager in North Scottsdale & have been using Magic Pest Control for 2.5 years w/o challenge. We use them for general pests (insects) as well as spider, and rodent control. Their pricing is great and with minimal follow-up I've been able to present a top quality Class A building to our guests. 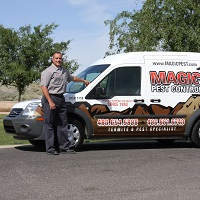 We have been using Magic Pest Control for more than 8 yrs for controlling the bugs in our yard and preventing termites. Pricing is reasonable and they are always on time and friendly. Too early. Waiting for results.xxxxxxxxxxxxxxxxxxxxxxxxxxxxxxxxxxxxxxxxxxxxxxxxxxxxxxxxxxxxxxxxxxxxxxxxxxxxxxxxxxxxxxxxxxxxxxxxxxxxxxxxxxxxxxxxxxxxxxxxxxxxxxxxx. We have been using Magic Pest for a couple of years and what I really appreciate is we have the same technician come to our home. He is very nice gentleman and does a fabulous job. Great service. always on time. Cindy is a Gem in the office. Beau was very nice and was very friendly at 7am. I've been using Magic for years and have had them in for regular maintenance as well as ants and a bee hive. In all cases, they have performed in an exceptional manner with professional people and only one that hadn't yet gathered enough experience in dealing with customers. I particularly enjoy the times when Papa gets chased out into the field because he's a really neat person to talk to aside from his exterminator skills. My best wishes my friend, may this year resolve all of your worries in your favor. We have used your service for about 6 months. Scorpion spraying. We are very happy with the results. The service technician was very knowledgeable and professional. He answered all my questions and very friendly! Thank you! Several years and we are very happy with the service! We have had great luck with Magic since we started having them come the fall of 2014. The guys are always nice and respectful. First service was performed in October 2014 the crew was very efficient and the treatment drilling was hardly noticeable. Justin came back out this January for a re-treatment and was very professional and did an excellent job . This company really stuck by their warrantee. We use regular pest services, termite control and weed control. We have been using Magic Pest Control since early 2009 to spray the exterior of our home. Their service is outstanding. The arrive on time, do a professional job and their technicians are wonderful. David has been taking car of our home for the past year or so. He is always friendly, wonderful to talk with and does a great job. Sebastian, before David, was also a wonderful technician. I highly recommend Magic Pest Control. Sebastian is the greatest :) what a fantastic job! Very courteous staff, from phone call to techs. On time and quick to get in and out. I used Magic Pest Control for a couple of months in the summer of 2016 for scorpion control. They are great. I now have them coming monthly and I am very pleased with the service. Sebastian is the best! Always punctual. Always polite. I hope you appreciate this guy. Great service, the techs are always really friendly. David was very thorough. David went the extra mile to ensure that my interior, garage and exterior were protected. I just had a baby and I am very pleased with how detailed David is. I know I will not have to worry about my son being stung or bit. I will recommend Magic Pest control to anyone. We have been using Magic Pest Control for almost 3 years now. Great service and great price! I called yesterday and Derek showed up first thing and looked at our bee problem then bright and early Gabe was here to rid of us our 3000 bees! Amazing and Fast service!!!! We have use Magic Pest Control for over a year. We use a monthly service plan and love it. Our technician is wonderful and does a great job! I've been with Magic for about 20 years for pest control. Richard, in the past, and Gabe now, pay close attention to detail and remember the special things we like to have done. Been using Magic for the past nine years. They are always responsive, on-time and their techs are friendly and competent. Who could ask for more? We started uses Magic Pest Control 8 months ago. They do a thorough job spraying inside and outside of our home. We haven't had any issues with bugs, spiders, scorpions, etc since started using them. The guys who come to spray are always very friendly.